The fall semester is here and so are all the students! Looking to catch up on all things Aztec Student Union? What’s New with the Union? This SDSU NewsCenter article gives Aztecs the inside scoop on summer developments at Aztec Student Union. This article for a local business newspaper, The Daily Transcript, details the current construction projects on campus, including Aztec Student Union. This newsletter article by construction partner Sundt provides some insight into the challenge of creating the Aztec Student Union’s mission-style good looks in a contemporary world. 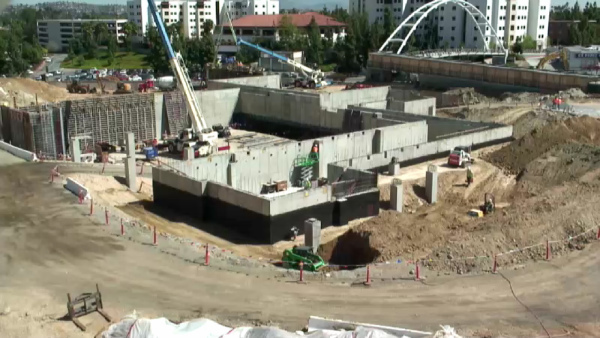 A bird’s eye view of the concrete work at Aztec Student Union. Image courtesy of Sundt. To stay up to date on Aztec Student Union, be sure to visit AztecStudentUnion.com, “like” us on Facebook or follow us on Twitter @AztecStdntUnion.